We've had a screen free day today (exception allowed for blogging) and it's been awesome. We've played with puzzles, we've read stories, we've played chasing games, we've attempted to start Christmas decorating, we've felt chilled and slow and warm and happy. A little bit chaotic at times, and not perfect, but happy. I pray that we will always have days like this - a break from busy life, just to be silly. I hope she remembers days like this, days when we play and she just stops to stare right into my make-up-free face and give me a big fat grin and a kiss. I hope she remembers me being a fun Mum. Terrible bed hair and all. Anyway, I was slicing oranges to dry out for Christmas decorations (I say this casually as though I do that sort of thing all the time, but I had to Google it first and I had a few moments where I almost said a bad word because the bluntness of my knives were making me angry) and Jellybean was playing with porridge oats on the floor, tipping them in and out of bowls and scattering them all over the floor and occasionally she would come begging for scraps of orange and I'd give them to her and she'd toddle off, orange juice running down her arms and a big smile on her face. And it hit me: I feel Christmassy! My house smells of oranges, my daughter is playing with the last thing my Granddad bought me when he was in the hospice shortly before his death (an enormous, white, fluffy teddy with a Santa hat on. Bear in mind this was 1992 and I was four years old), and I feel Christmassy. Wanna see some Christmas lights? There's a few there for you. So I expect this is old news to a lot of people, but I've only just spotted it on my Facebook feed: NFL player Andre Johnson taking at-risk kids on an 80-second shopping spree in Toys R Us. As in, grab as many toys as you can in 80 seconds. It's like Supermarket Sweep only a million times better. Children singing Christmas songs makes me cry (in a happy way!) In fact, little children singing in general always makes me cry. I am the person that is wringing her hands and furiously blinking back tears when Sunday School comes out to sing to the whole congregation at church. Because when you're that good, why not sing louder than everyone else?! Craft fails make me feel a lot better about my own festive disasters, so here is a list of 20 of the funniest, most-dreadful-looking Christmas craft fails for you. Meeting Santa. For some children, it's the most exciting thing in the world. For others? Not so much. To be fair that Santa is kind of horrifying. I don't think we'll be taking Jellybean to meet Father Christmas any time soon. I think she'd scream just at the sight of him. 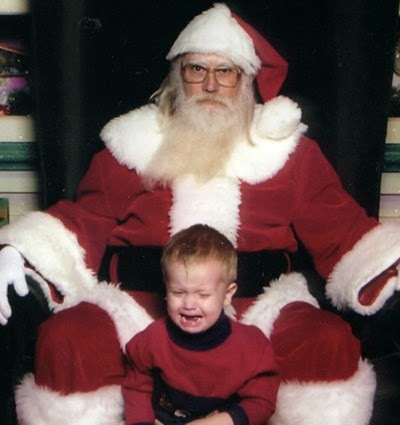 Here is a whole bunch of pictures of terrified children meeting Santa Claus. It is quite a sight to behold. Bored with the traditional cardboard-and-cheap-chocolate advent calendar combo? Pop down to Harrods where you can get this lovely 24-piece advent house. And it's on sale too - down from £12,000 to just £9,600! And finally, this is NOT what I plan to be doing with my Christmas eve ..!